RECORD BREAKER Eamon Keane from Louisburgh set yet another Guinness World Record for weightlifting in 2011. He is pictured here in full flight. WELL-KNOWN Louisburgh weightlifter Eamonn ‘Ironman’ Keane rounded off a remarkable year when he received news last week that he had broken a thirteenth world record. The powerlifting legend set his latest Guinness world record in the Louisburgh GAA club gym on September 28, but onlt had it officially ratified by Guinness World Records last week. The record was for ‘Most Weights Lifted by Dumbbell Flyes’ in an hour. Keane managed to lift an astonishing 40,600 kg in sixty minutes. Incredibly, the only record Keane set whilst injury-free was his very first, for most weight bench-pressed in an hour. That was set in July, 2003 when Keane lifted a phenomenal 138,480 kg in the time allowed. In layman’s terms, that’s the equivalent of lifting 1,700 80kg men (that’s 12.5 stone) in an hour. Think the entire attendance of a Mayo GAA Senior Football Final being bench-pressed in sixty minutes and you get the picture. But how has he managed to set so many world records since whilst injured? 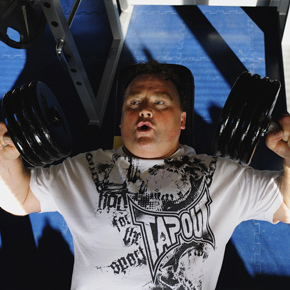 The record that Keane is proudest of is his first — the bench press, set in the World Gym in Marina del Rey in California. It’s easy to see why when you hear what World Gym founder Joe Gold, a mentor to people like Arnold Schwarzenegger and Incredible Hulk actor, Lou Ferrigno, had to say after he broke that record. The year 2011 was also a good one for Eamonn as during the year he received his sixth degree (sixth dan) black belt in Mugendo Full-Contact Kickboxing in Dublin.